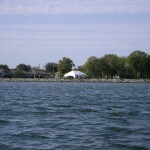 The Mile Roads are the stretch of water on the U.S. side of St. Clair that span from the streets that dead end at the Lake starting with 9 Mile Road and ending as far as 16 Mile Road. An argument can be made that the Mile Roads end at around 14 Mile Road instead. Ease of navigation and high catch production for bass are two of the top reasons this spot is recommended. If you stay in water depths of five feet or more there is little in the way of navigation dangers. 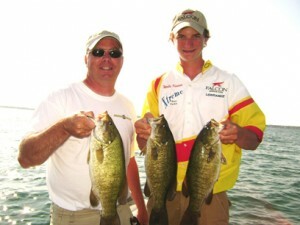 Catching bass can be as easy as finding other boats and pulling up to the same depth range to fish. Getting to the Mile Roads is easy. There are no less than four launches that are close to the area. If you launch at the 9 Mile or Cutoff Launch you are right in the area. If you launch at Lake St. Clair Metropark or Harley Ensign, the Mile Roads are South, just minutes away. You can fish in just a couple of feet of water or in the summer months, head out to 18 feet of water to hover over schools of smallies. You can find the best depth to fish at with a simple process of elimination. Start shallow then fish your way out deep or start deep and fish your way in shallow. The slightest change in the bottom content or structure can hold smallmouth at any point in the season. You will find a good supply of curly leaf pond weed (or cabbage) that the smallies love and varying degrees of rock. Ken and his son, Wells Kaiser had a good day on the Mile Roads. Xtreme Bass Tackle Formula G3 rocked on this trip. There is never a year when the bass are not at the Mile Roads. The question of whether or not tournament quality fish can be had needs to be answered each year. 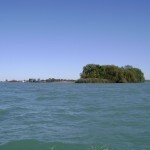 Lake St. Clair, the St. Clair River and the Detroit River have a lot to offer but getting your feet wet at the Mile Roads is a great way to start exploring everything that this body of water has to offer.